Kendall Buster was educated as a microbiologist and then became a sculptor. 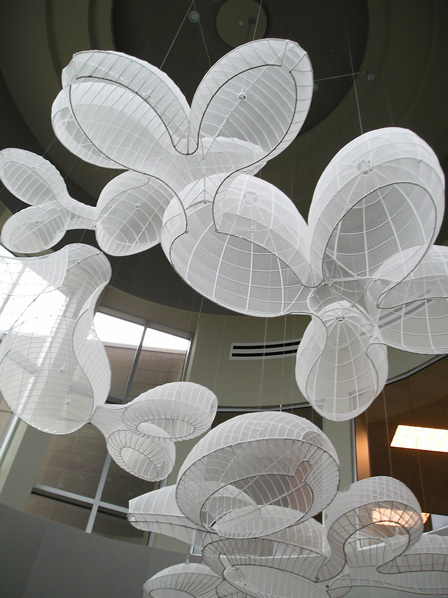 Her scientific training is manifest in her work: huge sculptures, often made of fabric over metal armatures, that refer directly or obliquely to the cells, vessels and biological processes of living creatures. I was drawn to this 2004 piece, Parabiosis IV, simply because of its intriguing beauty, but I had no idea what it meant. I discovered that parabiosis is a technique dating from the 19th century in which two living animals are joined together surgically and develop a single, shared circulatory system” (source). In recent years, researchers have used the technique in mice and found that giving old mice “young blood” through parabiosis may enhance neurogenesis (brain cell growth) and reverse age-related degeneration of the heart muscles. 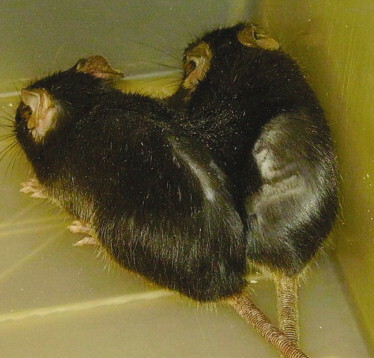 So obviously, this is an exciting field of research – but it’s also deeply creepy, involving stitched-together “frankenmice”, which are quite unsettling to look at. So let’s thank Kendall Buster for presenting this thought-provoking concept, rich in history as well as promise for the future, in such an attractive (non-bloody, non-furry) way. Much more at Kendall Buster’s website. This entry was posted in The Art of Science and tagged Biology Art, Kendall Buster, Parabiosis, parabiosis art, science art. Bookmark the permalink.